Jockey Ryan Moore finished third on his return at Newmarket after more than two months out with a neck injury. Three-time champion Moore, 32, rode Peterhof for trainer Sir Michael Stoute in the Arkle Finance Handicap, which was won by Rare Rhythm. "I've not really targeted this week, but I am pleased to be back and ready for some good races," he said. Moore, 32, was injured at Newmarket's July Festival when his horse Newton's Law became trapped in the stalls. 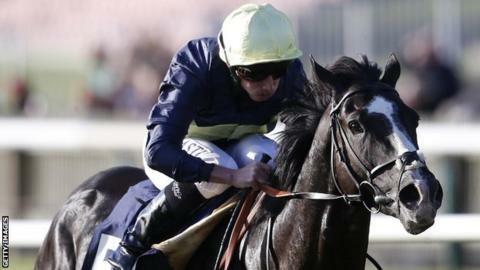 The jockey, who rode a record nine winners at Royal Ascot in June, is back for flat racing's big autumn contests. He is also scheduled for three rides on Friday, including Royal Ascot winner Time Test in the Shadwell Joel Stakes. Moore won the Melbourne Cup on Protectionist in November 2014 and as well as the Australian meeting, he would be available for fixtures including the Prix de l'Arc de Triomphe, British Champions Day and the Breeders' Cup. Earlier this year, he was appointed to the role as number one jockey to leading Irish trainer Aidan O'Brien.